This one came close to not happening! Sunday morning, this chick was born … in my head, anyway … then things went array … life almost got in the way of its birth. I made and drank coffee. I found a puddle of honey in a kitchen cabinet … what a mess! Warning – do not turn an almost empty, tightly closed, squeeze bottle of honey upside down … it will probably leak. I made macaroni salad, while the Peanut Butter Man was under the kitchen sink trying to repair the leak … it is so nice that he is a handy man! I was the plumbing assistant … as in – hold this, twist that, pass me a towel. I made lunch for the plumber hubby Peanut Butter Man. There was no water in the kitchen for 3 hours and the bucket is still under the sink … parts are ordered. Finally … about 4:00 the birth of the chick began … no eggs involved! Place a peanut m&m on base and let harden. 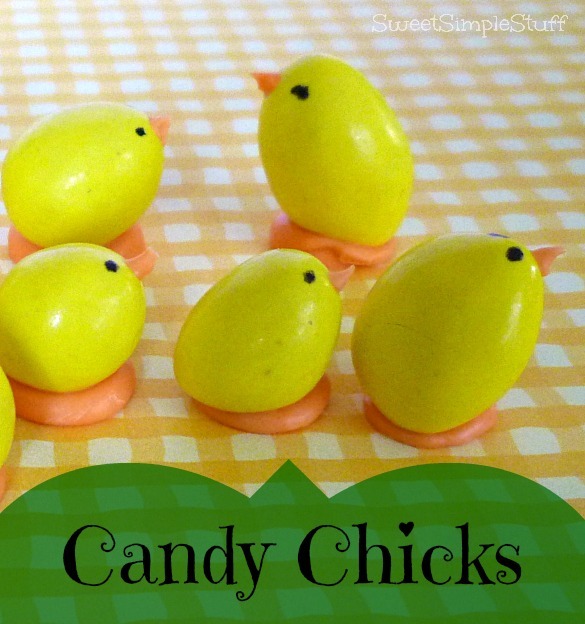 Use orange candy to make a beak. 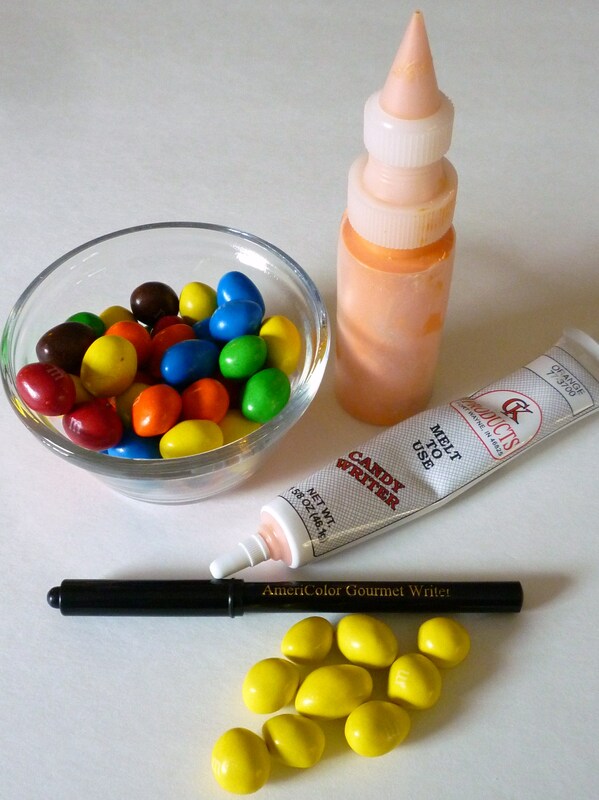 Use marker to make dot eyes. Use marker to draw wings, if desired. 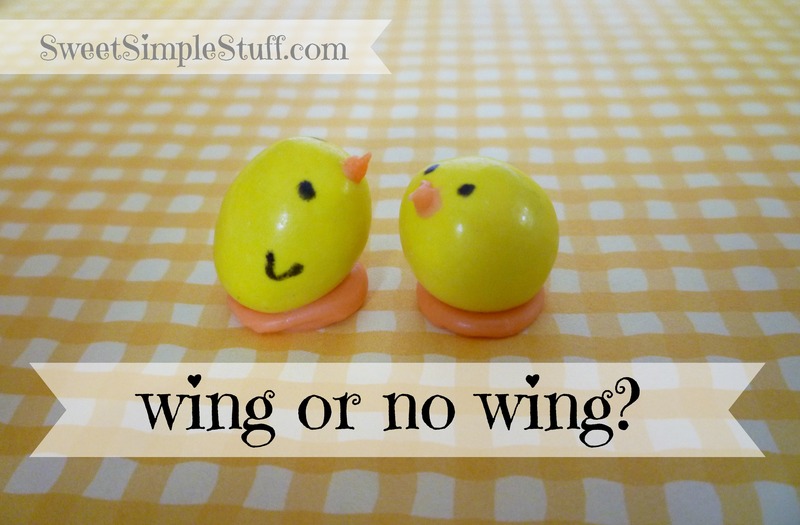 So … Wings or No Wings … that is the question! What’s your vote? Those are the cutest ever!!! Those are cute! I feel for anyone who is dealing with someone working on a masters. Been there, done that. Poor chicks, drowning in whipped cream. Otherwise, this is absolutely brilliant, Brenda. Glad to hear, too, that you’re living a normal life, with leaks (honey and sink) and all! These are adorable. I like the wings. Now them are just darn right adorably cute..
On your cupcakes, you could always color some coconut in green,sprinkle some on top and then set your chicks in the ‘grass’. Might help in keeping them from sliding off that way. Let’s see, I think I’ll ‘wing’ :} it and maybe do some with wings and some without. Getting right down to it, I must say I Do like the wings. Oh these are so adorable. I like a mixture with and without wings as it gives them personality. Your posts bring so much JOY! Love how you share about your family and involve them in your “passion.” I vote for the wings – what if you rounded them more? I am going to try this one! The cupcake finale is icing on the cake! Ha! Also, you could make a nest – out of chow mein noodles coated w/butterscotch chips? Or coconut flakes, Special K ??? Can’t wait for you next moment of “downtime” when you delight us all again! Thank you for sharing your gift – and it truly is a gift!! You are too kind 😉 I thought about nests too … after I finished! I vote for chow mein noodles and butterscotch! They are both adorable but the wings win with a very slight edge. Love them! Is it okay to eat the marker? These are sooo cute, think i will make them with Jessica, my Granddaughter. And I can’t decide wings or no wings so I’ll just go with both. Thnaks again Brenda for your creative ideas. Oh my goodness these are so cute!! Pinning and sharing on my FB page! Both with and without wings are cute, but wings make it impossible to not know they’re chicks. You could put them on a small round orange colored cracker instead of making their base out of orange colored chocolate to make them an appetizer vs a mini dessert. These are super cute! I vote no wings! Gotta “pin” this one – I love the wings but I’m clumsy when drawing on stuff life round food so mine will probably need to be without wings because this 73-yr-old definitely has to make a bunch of these for quickie Easter give-away’s – it also means I will be forced, yes, forced to eat those other peanut m&m’s – the ones that are not chick-colored but it’s a sacrifice I will have to make (sigh). Thanks for the heads’ up about the remaining m&m’s (if they do, indeed, exist)…can’t wait. 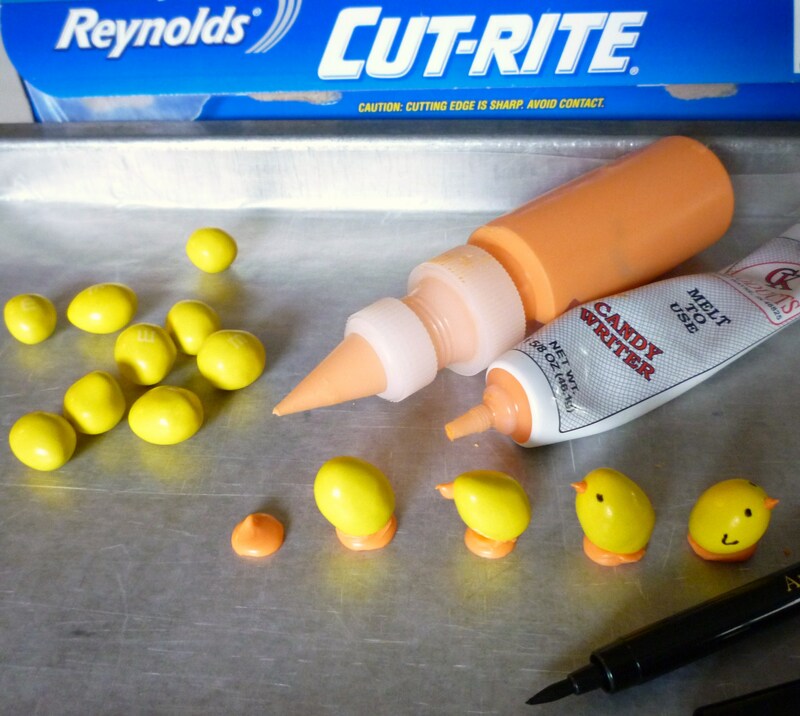 I gave up chocolate for Lent and will go nutz on it as of Easter Sunday…again, these are adorable – can’t wait to get the edible marker – have to find one of those. Be strong … resist the m&m’s 😉 You can find the markers at most places that sell cake and candy supplies or online (Amazon). If you can’t find the markers, try melted dark chocolate and a toothpick! You are too kind 😉 Wings or no wings … it’s a difficult decision! These are ADORABLE! Found you at TT&J, and just subscribed to your blog. Pinning this for Easter, as well. Thanks for sharing! Thank you so much ;). Adorable. Pinned to my Springtime ~ Easter board. Would love you to visit or link up anytime on homework. I am so happy that you like them :). Thank you for the invite! Those are so adorable. Pinning them! Thanks for sharing! Those are seriously tooooo cute!!! I actually like both versions, with and without the wing!!! 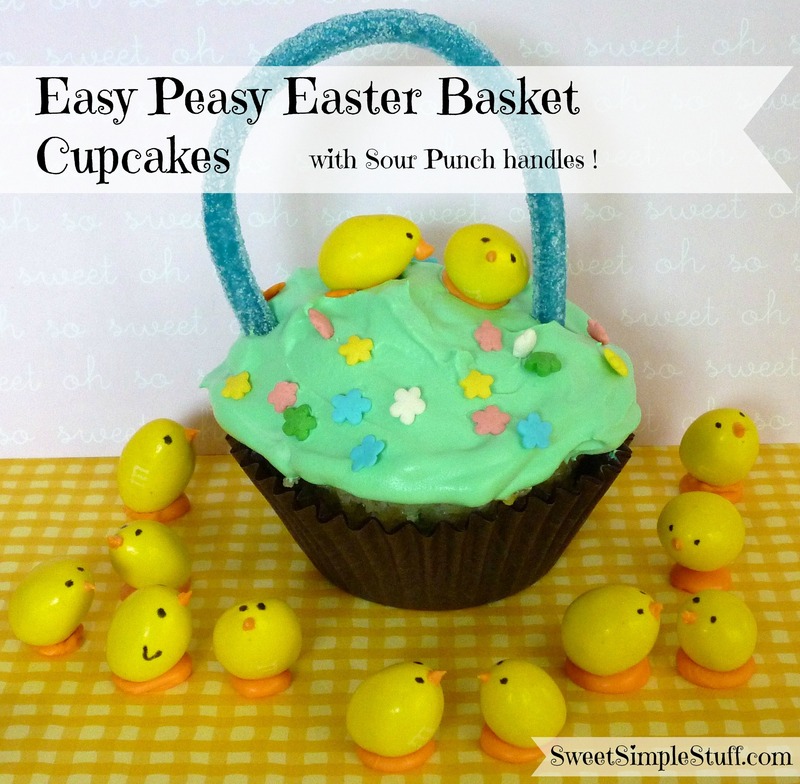 Such a fun Easter treat!!! These are WAY to adorable. Your’e so creative! WINGS!!! Put wings on these little cuties. Thank you for sharing. OMG, these are just too cute for words! I vote for wings, naturally 😉 , and will try to save the other Ms for your next rumored project. Visiting from I Heart Naptime, new follower and I’m pinning this — thanks! You are very welcome 😉 I hope the chicks put a smile on everyone’s face!